We have had some great themes over the past 5 years the Garden of Fire has been in operation. Water, wind, earth, fire…but this year’s theme of Powerful Pollinators is by far my personal favorite! 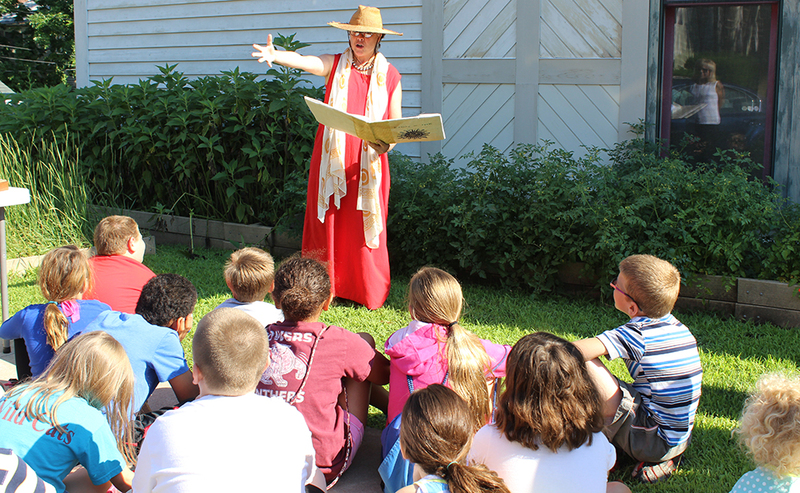 Partners in the Garden of Fire will spend the summer teaching local youth about the importance of pollinators on Earth; a timely and essential subject. Pollinators play a powerful role in the functioning of our food web and humans literally would not survive without them. Pollinators range from many types of insects – bees, butterflies, moths, beetles and flies, to bats and birds. Pollination happens when pollen is moved within individual flowers, or carried from flower to flower by pollinators. Worldwide, approximately 1,000 plants grown for food, drink, fiber (for clothing and other uses), spices, and medicines have to be pollinated by animals. Food and drink made with the help of pollinators includes: apples, blueberries, chocolate, coffee, honey, melons, peaches, potatoes, pumpkins, vanilla, almonds, and tequila. Most crops that our ag animals (cows, pigs, chickens) eat are also here because of our pollinators. In the US, pollination by honey bees, native bees, and other insects produces $40 billion worth of products every year. The most prolific pollinators are the honey bees. Honey bees are not native to the US, they were originally brought here in the 1600s by colonists from Europe, mostly for their ability to produce honey. Most of the honey bees we see today are of Italian and German descent. Honey bees have a fascinating life history and once you know about it, it’s hard to not love them. Although some people have bee fear, and some are allergic, honey bees often get a bad rap for being dangerous. Honey bees are pretty docile and will only sting when they feel threatened. They die after they sting, so stinging is saved for something serious. In a honey bee colony, the girls do most of the work (thus are called workers) – they are the nurses, the cleaners, the guards, the collectors, the honey-makers, and the keepers of the Queen. The males, called drones, must leave and mate with a queen from another colony. The workers only allow the drones to live if there is enough food available. The Queen is the longest-lived in the hive and she lays all the eggs so that the colony can multiply and thrive. The communication between bees is sophisticated and efficient. They can communicate where food is, when they need to make a new queen, when to swarm, when danger is near, and much more. Honey bees collect pollen and nectar for the survival of their colony, and in the process, their hairy bodies deposit pollen and facilitate fertilization so that plants can make fruits and seeds and therefore new plants. Learning about bees and how to keep them numerous and healthy is a smart thing to do. If you have been paying attention, you might know that bees are in trouble. There is evidence that the worldwide decline of bees is happening due to a variety of factors- all human-related. Bees suffer from habitat loss, chemical poisoning, disease and parasites. The United States has lost more than half of the honey bee colonies managed by beekeepers in the past 10 years. This is an alarming thing and we need to do all we can to reverse this. So, if you like to eat and drink, and you want to do something to help our honey bees, what can you do? Install houses for bats and native bees, or even become a beekeeper yourself! And most importantly, educate yourself and others so we can all work to keep our Powerful Pollinators alive and doing their good work for our survival. Last week, Garden of Fire partners met at The Rockwell Museum to finalize many details about programming and discussed aspects of this year’s theme of WATER. We are all very excited to be flowing into year three of this wonderful program for youth in our area . Water is essential to the existence of life and can be a great symbol of the relationship between all living things. More than half of the human body is composed of water and about 71% of planet earth is water. Water can move through just about anything and over time can carve canyons. Drop by drop, little by little, in the lives of children and teens who participate in the program, we hope to help open a stream of expression through the arts and a sense of wonder through the science that can move through their entire lives. Participants can look forward to many water-themed projects and programs. For example, as the youth centers grow their gardens, they’ll work with Tanglewood Nature Center and learn about how crucial water is for gardens to grow, and how plants adapt to different climates based on availability of water in their natural habitat. At The Rockwell, students will make their own Clay Animal Garden Sculptures, created with symbolism meant to protect and grow their garden. With CareFirst, students will make their own rain sticks in conjunction with reflection on internal growth. We are so excited to launch this summer’s program – it can’t come soon enough! Look for the full summer schedule coming soon. Until then…. I am very pleased to be presenting at the 12th Annual National Summer Learning Association Conference. This year’s conference theme, Renewing the Promise and Purpose of Learning, celebrates the joy of learning, the perfect tie-in with our own Garden of Fire Summer Program. I, Gigi Alvaré , Director of Education at The Rockwell Museum, will travel to Baltimore to present with my colleagues Emily Hofelich-Bowler and Alli Lidie; we’ll present on how networking and collaboration can spark innovation in summer programming. Our presentation, entitled Garden of Fire: Reaping the Rewards of Community Networking Through a Joint Summer Program, will highlight how several organizations and programs came together in a rural community to create a rich summer program for youth. The Garden of Fire was awarded a National Endowment for the Arts Challenge America Grant after the first summer of programming. The session will give context to the Garden of Fire collaboration with an opening discussion, led by Alli Lidie, Deputy Director and White-Riley-Peterson Policy Fellow of AfterSchool Works! NY: the New York State Afterschool Network (ASW:NYSAN). Alli will speak about the structure for regional after-school networks in New York State that bring together both after-school and summer providers in their communities. The Garden of Fire program grew out of the relationships formed through network participation, and through work with The Triangle Fund, a funder and member of the network. The session will also touch on work done by other regional networks in New York. The Garden of Fire is a project conceived collaboratively by local organizations whose purpose is to build capacity, depth and the integration of art and science for programs serving at-risk youth in Steuben County, New York. Emily Hofelich-Bowler, Executive Director of the Addison Youth Center, will speak about networking with the local school districts to optimize resources, and how incorporating state-wide learning initiatives (STEM) as part of the program gave the summer program more leverage and legitimacy in asking for school support. By providing programming led by professional artists and educators held in museums, gardens, and fields, the local community and region opens up to students who otherwise might have very limited opportunities. It is our hope that the model program we have collectively created will spark the imagination and action of other communities to build their own Gardens of Fire. Together we can care for our most precious gifts: the earth itself and the children who live on it. Thank you to all of the staff, supporters, volunteers, friends, planners, students, leaders and friends who made the Garden of Fire Festival happen on Friday afternoon. Without people like you, who believe in arts education and making our community a special place for children to grow up, projects like this would not be possible. Too many people to photograph! Here’s a small sampling of the supporters and staffers who made the event possible. More pictures and videos coming soon! Search #GoFFest on Instagram for another small sampling on videos and pictures. The Garden of Fire festival is a culminating celebration of youth learning through artwork, performance, and music. 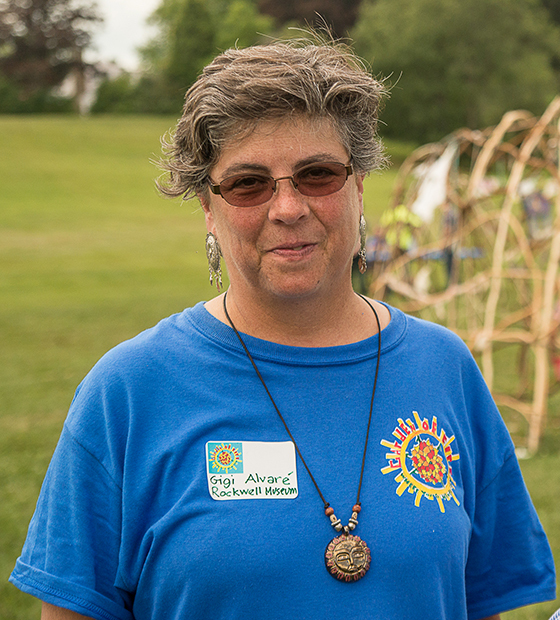 It provides a place and time to joyously celebrate the earth, wind and sky in unison with caregivers, teachers, artists, and community members. The festival also provides opportunities for social interaction; a time when youth are encouraged to interact with their peers outside of a learning environment. The festival is a proven “stage” where non-participating/hesitant youth who desire a place to showcase their learning can demonstrate self-confidence alongside their peers. The program provides the participating youth opportunities to expand their horizons by meeting in different locations and meeting people from other communities. Volunteers are needed to help make the Garden of Fire Festival a success! The festival will take place on Friday, August 14, 2015, from 9 a.m. – 5 p.m., at the new CareFirst facility in Painted Post, NY. Volunteers may sign-up for the full day or for various shifts: choose from a variety of . We appreciate the passion and knowledge that a willing volunteer force provides. All volunteers whose shift runs through lunchtime are welcome to partake in the food and beverages offered. The Festival serves approximately 145 youth, who will be accompanied by 30-40 volunteers, 20 staff members from the partnering organizations, along with community dignitaries and members of various boards. 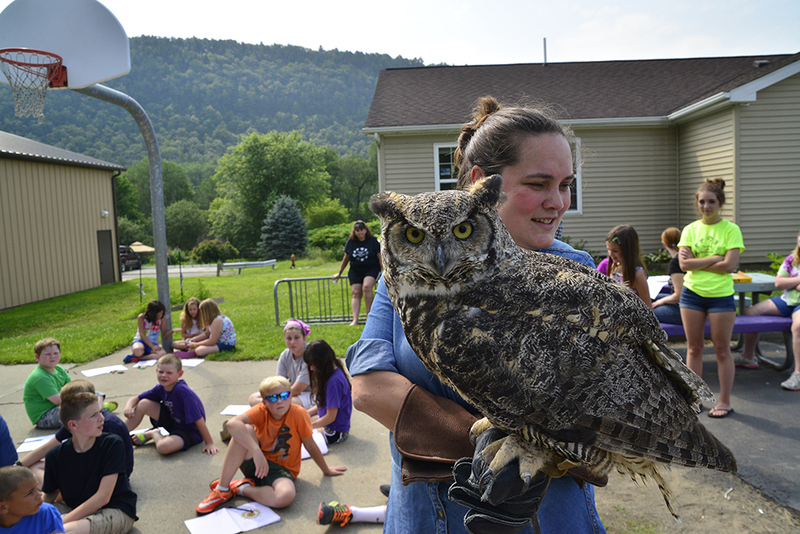 We’re very excited to be featured in the New York State Afterschool Network (NYSAN) Learning Brief highlighting summer learning opportunities across the state. Find the full brief and additional fact sheets here. Find us on page 5! “There is a well-documented need for a statewide, coordinated system of youth programs that operate outside of school hours, including before and after school, and during weekends and other school breaks, to provide high-quality, enriching experiences that contribute to the learning and healthy development of youth. Given their sizable impact on young people, summer learning opportunities must be a critical component of this system. However, far too many children have little or no exposure to the safe, supervised learning and enrichment activities that summer programs can provide. “Summer experiences help meet the needs of all children; this is especially true for children from traditionally underserved communities, including children of color, those from low-income families, and children living in rural areas. Research shows that summer learning loss is a significant contributor to the achievement gap; students from low-income families typically lose two to three months in reading achievement and two months of math skills during the summer months. Well said! And Happy Friday!